However, when we look at NOAA’s official temperature record for New York State in January, 2014 only ranks as 30th coldest since 1895, with a mean temperature of 16.9F. So I thought I would do some digging into the actual temperature data, to see if NOAA’s version stacks up. I promise that you will be astounded at the results! New York State is subdivided into 10 sub-divisions, and I have taken a close look at one, Central Lakes (Div 10). The NOAA graph shows a similar picture as the Statewide one, with a mean temperature of 17.8F, ranking 24th coldest. Since 1889, monthly state climatological reports have been archived, originally by the Dept of Agriculture, and now by NOAA. I have decided to compare Jan 2014 data, with the same month in 1943. According to NOAA, the latter was not dissimilar, with a mean of 18.7F, and a rank of 28th, for Division 10. In other words it was 0.9F warmer than 2014. Below is the report for January 1943. I have given all of the PDF links, but the State reports can also all be accessed here. Indeed, it is arguably worse than that. You will notice that there is an outlier in Syracuse, which suggests that 2014, quite nonsensically, was warmer. 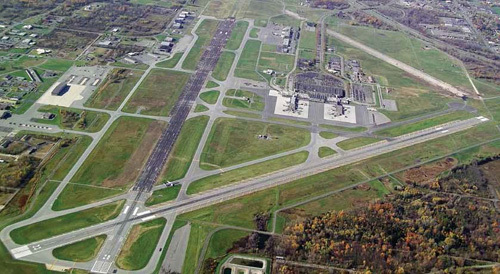 Syracuse’s temperature station is, however, based at the International Airport there, slap bang in between runways. (The blue marker is the current site). The weather station has been at the same location, to within a few hundred yards, since 1929, when it looked like this. During the war it was used as a flight training centre. 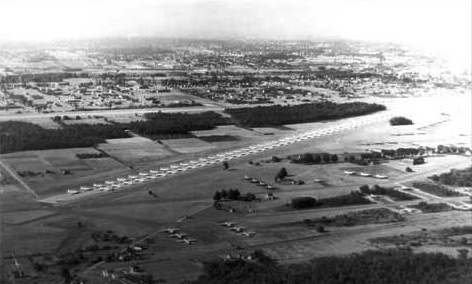 Now it is an international airport, with two asphalt runways handling nearly 2 million passenger a year. Clearly, given the divergence in temperatures between Syracuse and the other six divisional sites, there is a massive UHI effect here. If we exclude Syracuse, which clearly should not be used for climate purposes, the average difference between 1943 and 2014 rises to 3.3F. This means that NOAA has adjusted temperatures by an astonishing 2.4F, or about 1.3C. Of the seven sites, six have remained at the same locations, within a few yards. The station at Auburn has moved by a couple of miles, but is still in similar terrain. There is no reason then why any major adjustments should have been required at any site. Apologists for temperature tampering usually say it is all due to TOBS (Time of Observation). Yet the station at Ithaca, based at Cornell University, has used morning readings throughout. With a temperature difference of 2.9C, this is typical of the other sites, suggesting that any bias from TOBS is minor. I have checked out some of the other divisions, and these come up with similarly large discrepancies. I will post detail tomorrow, as this is already getting a data heavy post. I have also looked at the annual data, and this gives similar results to January. Again I will post up tomorrow, along with a very significant analysis of the Syracuse numbers. The impact of these adjustments is simply staggering. If Jan 2014’s temperatures are reduced back down by 3.3F, they become 14.5F. This would make the month the 9th coldest on record in Central Lakes, ranked between 1940 and 1981. The winter of 2013-14 was one of the coldest and snowiest in decades across Western and North Central New York. These wholesale changes cannot be explained away changes to individual stations. It may be that homogenisation procedures, infilling of missing data and urban heat islands have contributed. Under the new nClimDiv system, introduced in 2014, NOAA’s methodology is extremely opaque. They don’t, to the best of my knowledge, publish the data and adjustments used. In essence, we are asked to accept NOAA’s version without being able to check or verify it. Whatever the reason for the adjustments, the climate record for New York State has been changed out of all recognition, and bears no resemblance to the actual official data. Utterly scandalous but, sadly, par for the course for our climate data gatekeepers. Nothing will change until they are subject to a thoroughly independent official audit of their records and protocols. And, if an investigation doesn’t happen under a Trump administration then it won’t be happening anywhere any time soon. About time we had another whistleblower come to the surface and blow the whole corrupt edifice of data manipulation apart from the inside. Climategate 2 anybody? Unbelievable, but in the corrupt world of “climate alarmism”, somehow totally believable. In normal circumstances people would be in jail for this fraudulent behaviour. On the contrary, there are good reasons to adjust records when teasing out how siting-independent anomaly has developed during the decades. The temperature measurement produces a temperature that has shelter paint, runway alphalt, building, grass and treeline components. Those change, hiding small slow climatic changes in the anomaly in the long run. The question is the credibility of this statistical data torturing. Does it correctly handle events like felling trees or trees slowly growing back. I find it improbable, but I haven’t been studying/researching this art. Paul… As I mentioned earlier, I have been doing this for years. Check out Spokane, Washington. It was the “poster boy” for NOAA’s GHCN temperature adjustment methodology. Look at Felts Field where little has changed since 1932, while meteorological stations for Spokane have moved a great deal since the first one in 1880.. You will be surprised at what you find. The Smithsonian’s World Weather Records also has data to compare. This is key. Find a trustworthy source of original data, such as newspaper clippings – many sites hold archives, so not too hard to get hold of. Then compare them to the homogenised output from places like NOAA, UK MET Office and AS BOM. When the now eminent anthropologist Chris Stringer was a PhD student he traveled around Europe remeasuring neanderthal skulls with tools of greater precision than were available to the original discoverers. From his adjusted measurements he came to the, then heretical, conclusion that H neanderthalensis was not an ancestor of H sapiens, but a parallel species.This is now generally accepted, but what Stringer did NOT do is smash the skulls after his measurements to ensure that no one could carry out any further measurements with even greater precision and perhaps overturn his conclusions . What is not fully clear to me in the many occasions when adjustment by NOAA is commented on is whether the original data is still extant or whether it has been destroyed. Have they effectively “smashed the skulls” on much local original data so that their analysis could never be questioned. Maybe not destroy it, but certainly make it difficult to retrieve. This is especially true for their US Maps for older data where each measured state temperature is shown. Unless you keep a copy of the old map you’ll never see what they did… lower them. “Since the 1980s, we have merged the data we have received into existing series or begun new ones, so it is impossible to say if all stations within a particular country or if all of an individual record should be freely available. Data storage availability in the 1980s meant that we were not able to keep the multiple sources for some sites, only the station series after adjustment for homogeneity issues. We, therefore, do not hold the original raw data but only the value-added (i.e. quality controlled and homogenized) data. The priorities we use when merging data from the same station from different sources are discussed in some of the literature cited below. Parts of series may have come from restricted sources, whilst the rest came from other sources. His most telling graph is the one that compares the temperature adjustments to the global levels of CO2 over time. It shows that these organisations have been adjusting older temperature data down, just as you have highlighted above. The almost linear fit of the adjustments to CO2 changes confirms that global warming is indeed man-made, but through corruption of data, not CO2. Excellent work as usual Paul. Some day all this hard work will be recognised and of great facility – not least when the entire cover is blown on the CAGW fraud and its advocates are trying to pretend they acted in good faith. Reading the list of towns was a walk through my childhood. My late brother went to Ithaca in 1952, married my sister-in-law who was from Bouckville and a student at Keuka College in 1954, and earned his PhD in chemistry from Cornell in 1956. He worked in research at Eastman Kodak in Rochester for several years, did a post-doc at Cornell and then moved west, ending up in Fort Collins, CO.
One Christmas, he and daddy went to Oswego. Daddy had some of the most spectacular slides of the >6′ of snow. Of course they get the lake-effect snow dumps and often have the highest snowfalls I believe. Paths had been carved out of the snow around the town. I remember a slide of one of the red mail boxes on a post with snow walls to either side. “Recent memory” is hardly a scientific term and is highly subjective to one’s personal experience. Is Mr. Cuomo trying to make excuses for his lack of preparation for WINTER by disallowing pipelines or fracking in New York State? I worked in Oswego for ten years so I know exactly what you are talking about. Cuomo is running for President on the CAGW is an existential threat ticket. Apparently no one in his inner circle got the memo that his vision for the fossil-free energy future is failing everywhere it has been tried. Anyone who dares question the party line is ostracized and shouted down. The question is whether the symbolic gestures of blocking pipelines and fracking will lead to obvious problems that cannot be excused or covered up before or after the presidential run. Thanks for all of your hard work. Yet another nail in the coffin for the AGW scamsters. NOAA/GHCN, NASA/GISS and NCAR are all corrupt beyond any hope for reform. They all need to be defunded and hopefully Scott Pruitt will bring that about. Scott Pruitt is Director of EPA. I am not certain that he has any jurisdiction with those agencies. However, while the media is having their fit du jour over Donald Trump, behind the scenes changes are being made. I doubt that these agencies have escaped his attention. But, draining the bureaucratic swamp which has had years to fester is a huge job. Most helpful would be a changes in Civil Service to allow for more frequent change-overs of that mob. Right now, you should take a gander at the FBI, CIA and the other beauties of the so-called “intelligence” community. The corruption there is truly stunning and they did their best to take down this duly elected President, during his campaign and following his election. Explaining what has been going on takes a huge flow chart. It is difficult to explain it without eyes glazing over. During recent decades, and especially under the Obama Administration, EVERYTHING has been politicized–IRS, EPA, FBI, CIA,…..everything. This takes draining the swamp and the swamp is not happy about that. BTW, yesterday the Inspector General of the FBI found the 5 months of “missing” texts between Strock and Page where they are colluding with a “secret society” to take down Trump. Oops. “Draining the Swamp” was a wonderfully evocative image during the 2016 election. Now we are finding what a difficult task it is given that the “Swamp Creatures” at the CIA, FBI, DOJ and other three letter agencies are corrupt and confident that they can defy this president and the will of US voters. Today several states are challenging federal tax reform in the courts because it eliminates deductions on for state taxes. These states are the same ones that have encouraged criminality by allowing “Sanctuary Cities”. Donald Trump is our president because a majority of Americans are sick of stupid government that favors illegal aliens over US citizens. We are sick of government that destroys prosperity by sending our jobs overseas so we are reduced to existing on government handouts. We want a judiciary that obeys the law rather than one that makes the law. We want an executive that impartially implements all our laws without fear or favor. Few people realize that, in the USA, the accepted procedure in the 19th Century upon a change of President was for ALL federal civil servants to be immediately replaced. Of course, the State is now so enormous that this is not actually possible. Paul- the scam merchants must hate your guts! I look forward to seeing more of these comparisons. I dimly remember reading on this blog that the GWPF was planning to investigate the tampering with US temperature records. Is something still happening? The Australian BOM was caught setting limits at Thredbo and Goulburn NSW last August. They had them set to only record to -10 degrees Celsius knowing that both sites can get colder. They were caught this time but who knows how long it’s been going on. In order to making the stats fit the theory supposition, all it needs is a little tinkering here and there and if people aren’t watching……………. Paul is though, and a few others……………. another great take down pal, nailed ’em – again. Paul, they cannot use the TOBS and other adustments for that kind of change the official NASA/NCDC paper by Mene 2009 only shows a maximum of 0.5C after all adjustments. So it cannot possibly justify the sort of value changes that have taken place. 1) a component to bring any “outliers” into line with the rest of the region. In practice, this appears to mean changing temperatures to match the narrative, but I personally think it is a horrendous practice (if true). 2) another component to make the temperature records match the models. If true, this could only be described as scientific fraud. Of course, this varies from country to country and organisation to organisation. Which is a good indicator of their desperation to hide the truth i.e. that CO2 theory doesn’t work in the real world.